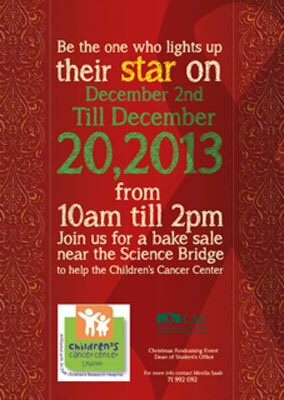 In the spirit of Christmas, LAU’s Dean of Students Office has organized a charity project to raise money for the Children’s Cancer Center. From Dec. 2-20 a charity bake sale will be held on campus, with part of the profits going toward presents that will be given to the children during a visit to the center. The rest of the money will be given to cover treatment costs. Please support this initiative, and do your part to help the children in need.